The Commonwealth Government’s $42 billion commitment to Building the Education Revolution (BER) program is funding a diverse range of capital works projects for school facilities around Australia. The scheme includes capital works with an environmental focus such as the installation of rainwater tanks. The rainwater tanks will enable toilet blocks to use harvested rainwater for toilet flushing. Glossop Primary School in the Murray Mallee region of South Australia recently installed a rainwater harvesting project, using BER funding. Rainwater is harvested from the school building roof and stored in 2 22,000 litre capacity tanks. The water is filtered and then pressurised using a RainBank PRO pump system from Davey Water Products . This was selected because it selects rainwater when there is sufficient water in the tank and switches to back up mains water supply when there isn’t. The power of the Davey RainBank PRO pump will also permit future expansion for watering the school’s gardens. The system’s hydraulic design was done by Andrew Williams from the Adelaide office of Lucid Consulting Engineers. “We designed the rainwater harvesting and delivery system as a simple, straightforward and easy to install pumped supply, drawing on the water held in the two tanks which harvest the rain water,” he says. Glossop Primary School principal Sue Andrew is delighted with the results. “We’ve received a couple of heavy downpours recently which have topped up our two tanks so we should always have sufficient rainwater available for all our toilet flushing and even garden watering needs,” she said. 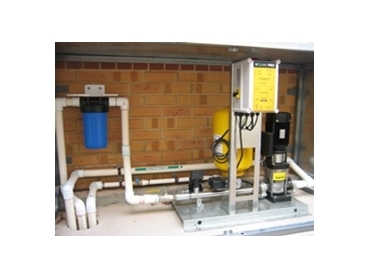 As part of the Commonwealth’s BER program, similar rainwater harvesting systems are proposed for at least two other school facilities in the local Murray Mallee region of South Australia.